When Jerri Stanard began teaching art in Dayton schools 20 years ago, the inner-city children she worked with hungered for an opportunity for self-expression, a safe place to let their guard down, and better ways to grapple with important or challenging ideas. Today, as executive director of K12 Gallery, Stanard is working to meet that need for students across the Dayton region. In addition to offering classes and hosting exhibitions of student work in a dedicated downtown gallery and learning center, K12 places professional artists into area classrooms. The group’s Artist-in-Residence program enables schools without an art program to engage a professional artist to work with students. Stanard and her education staff help the artists prepare lesson plans and choose the best methods to teach artistic concepts. Students can make mosaics, craft pottery, and create mixed media sculptures. No matter what art form they choose, Stanard said, the positive impact is obvious and immediate. Art encourages students to work through challenges, collaborate with others, and embrace and overcome mistakes. 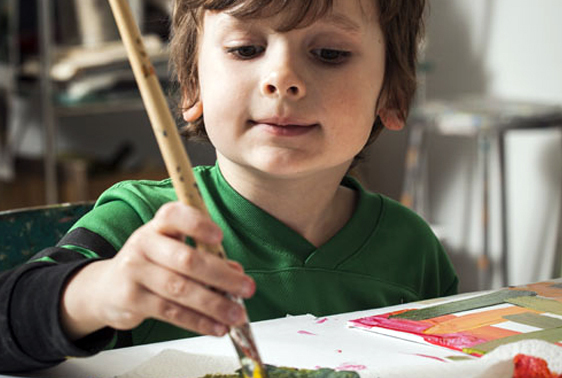 For some, art class is a place of refuge in the middle of a busy, stressful day of classes and problems at home. And the benefits carry beyond the art classroom, Stanard said. Learning how to make a new art project involves many of the same skills and steps used to master traditional subjects. In March, K12’s gallery was filled with work from local Catholic schools. Looking around, Stanard said their ability to think creatively, she said, will carry them into careers we can’t even imagine.